Mauritius is Not Just About The Seas You Sail, But Also the People You Meet Ashore. I walked barefoot on the soft white sand, stopping now and then to admire the seashells and small fish in pools of crystal clear water. It was low tide here on the east coast of Mauritius; the sun was about to set on the other side of the mountain and the sea was bathed in countless shades of blue. As the gentle waves caressed my feet, two figures, far at sea, caught my eye. Precariously balanced on the rocks, a lady wearing what looked like a traditional Indian salwar-kameez, seemed to be teaching her very young son the ways of the fishing rod. I watched in fascination as he tried to take the rod from his reluctant mother, almost tripping over in the attempt. After several tries, he found his balance by gripping her arm with one hand and holding the rod with the other. He caught no fish, but there was a sense of coming of age in his young face as they tip-toed ashore. I couldn’t help but cross their path with a smile, and ask – in English and then Hindi / Urdu – if they lived nearby? The ice quickly melted on that warm tropical evening as Uzma, the lady in the salwar-kameez, explained that with Ramzan starting the following morning, the entire family had come out to fish, to have enough to eat during the fasting period. Her husband was still at sea, and her daughter joined us shyly from her spot on the beach. Like most Indian-origin families in Mauritius, their ancestors were forcibly brought to the island by the British, for back-breaking work on the sugarcane fields. Life had changed for the better over time, as they adapted to their paradisiacal surroundings through hard work and a resolve to create better lives for their children. Indeed, as the family’s fifth generation, Uzma’s daughter enjoyed studying Urdu poetry at school, an unintentional connection with the past. Not so long ago, sugarcane workers had to produce 6-7 tonnes daily for meagre wages. When she graduates in two years, I’ll marry her off, Uzma told me with the proud smile of a mother that is way too common in India. To someone of her choice or your choice? I asked, not so candidly. The daughter, quiet all this time, laughed and answered before her mother could: My choice ofcourse. Gone are the times when girls married someone of their parents’ choice. We laughed together for a few moments, and I confessed that many parents in India still think otherwise. That put Uzma in a contemplative mood, as though a long hidden longing for India had resurfaced. Life must be so different there, she spoke softly, as though talking to herself. My husband works hard to make ends meet here; even during the fasting period, he’ll be working long hours, and probably be too tired to fish after that. Hard at work, to make paradise, paradise! I was struck by the irony of a place like Mauritius. People all over the world work hard all their lives to make enough money, so they can buy a dream house in “paradise” someday. Yet the island dwellers, who already have a home here, work equally hard to be able to just survive in “paradise”. Life isn’t easy anywhere, we agreed, and despite the fasting days and limited fish supply, she warmly invited me to her home for a meal. That Indian hospitality runs in the blood, I mused to myself, but sheepishly declined, feeling almost guilty that a ‘fancy’ dinner awaited me back at my resort. Farming life in the dramatic interiors of Mauritius. Everyone who comes to Mauritius falls in love with the island; but you, who live here, do you love it too? No matter what your problems are, you can come to the ocean and dissolve them. A palette of colors, aka a Mauritian sunset. Walking back in the fading light of day, I turned back to see the family excitedly gather around Uzma’s husband as he came ashore, admiring his catch of the day. That moment reminded of what the Arabs called Mauritius when they first arrived on the island in the 10th century: “Waqwaq” – another planet. Have you had serendipitous encounters with island dwellers on your travels? I wrote this post as part of the #MyMauritius blogging trip, created and managed by iambassador in partnership with Create, AHRIM, Mauritius Tourism and Air Mauritius. Opinions on this blog are always my own. Connect with me on Instagram, Facebook, Twitter, Pinterest and Google+ for more stories from my travels! Subscribe to my newsletter to receive travel musings in your inbox. Such a beautiful chance encounter with an Indian family. Its not difficult to find Indians anywhere on this planet, but conversations like the above make wonderful memories. A small correction. I hope I’m not annoying. The Arabic word for planet is Kawkab, not waqwaq. Cheers!! Keep your writings coming! Nice read Shivya 🙂 Wonderful. I really enjoy reading your travelogue. Thanks Kat, glad it got you thinking! Nice post 🙂 Looks like you are having a great time and loads of fun! Puts much into perspective, right? It was a serendipitous encounter. Great post Shivya. I have always felt, travel is as much about people as it is destination. Thanks Deepika, and I totally agree. You write so beautifully Shivya. It is like readers can understand your feelings. What a beautiful post! Both the words and the photos evoke so much emotion. Happy travels! Thanks so much Katt. As much as I love the sun, sand and water, the people are what make it Mauritius 🙂 More stories coming soon! Thanks for sharing such touching story Shivya! Amazing photos and I must say, a well Thought and well suited title as well! Your writeups inspire to travel. What lovely photography! You are a true inspiration Shivya! I am a newbie at blogging and you indirectly motivate me a lot! Thank you so much! Nice trip at Mauritius ! The title is spot on. We made our first trip to Mauritius last year focusing on sun, sand, and water but returned home with stories about the incredible people we had the priviledge of meeting and speaking with. Already working on our return trip. This is a fabulous post, as we visited the island of Mauritius in 2015 and it was a revelation. 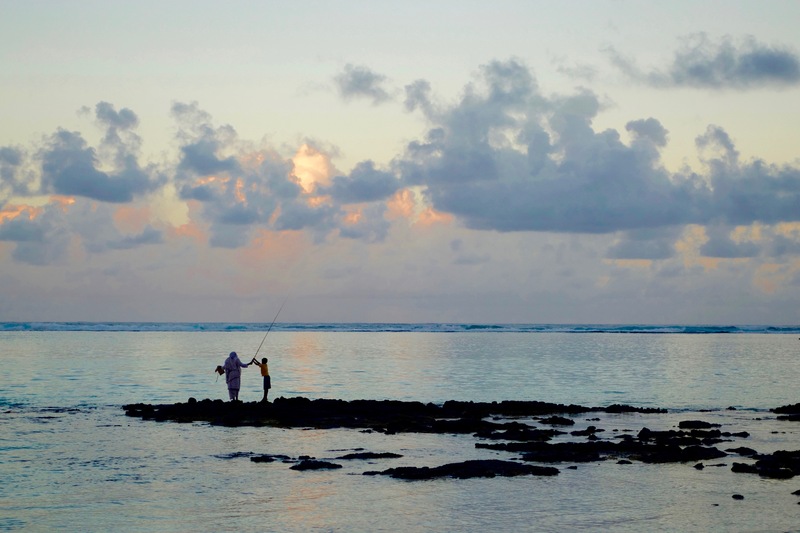 I loved watching the young people fishing at sunset near our hotel and they always made wonderful photographs! Previous PostWill 2016 Be The Year of Africa for Me? Next PostHow Responsible Tourism Can Challenge Patriarchy in India.